will open on March 4th with aftercare options available. Please visit the St. Andrew's website to register. What is Badgerdog Creative Writing Summer Camp? Each summer, Badgerdog hosts writing workshops for rising 3rd- through 12th-graders. These fun and challenging writing workshops run for two and three weeks sessions, Monday through Friday from 9:00am to noon, allowing students to work closely with a professional writer as they explore the arts of poetry, fiction, nonfiction, and playwriting. All campers experience the joy of performing and publishing their original work. For more than 10 years, Badgerdog's Creative Writing Summer Camp has given Austin youth a space to fall in love with writing, discover authentic self-expression, learn from a professional writer, and publish original work. Parents say Badgerdog helps kids and teens write with greater skill, comfort, and enthusiasm. Campers say Badgerdog helps them find confidence and play in the writing process. 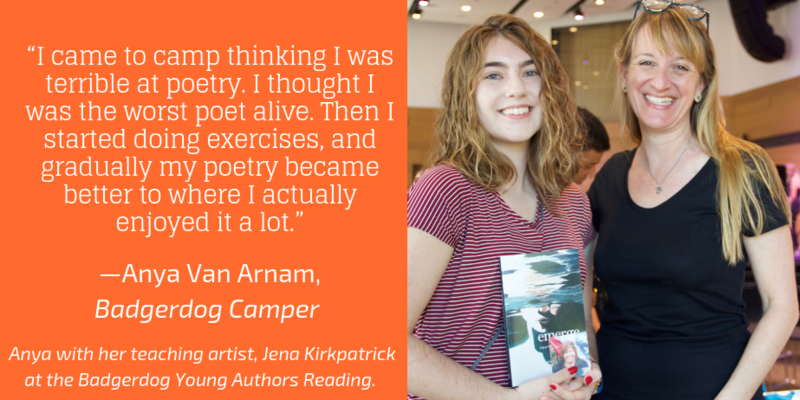 Read about camper Anya Van Arnam's evolution as a writer through Badgerdog here in the Cedar Park High School Paper. Sibling and early bird discounts available. A limited number of full and partial scholarships are available based on demonstrated financial need. Please complete a scholarship form (via this link) by April 1, 2019. Lessons are designed to be creative, surprising, and engaging. From 9 a.m. to noon each morning, campers learn through discovery, practice, mentorship, and collaboration in workshops with a student to teacher ratio of 1- 15. Each day, campers encounter the work of classic and contemporary writers, and they study the techniques these writers use to craft artful poetry and prose. Campers author numerous creative pieces in various genres, sharing their work along the way with their workshop colleagues. These summer workshops emphasize all aspects of the writing process, from idea generation to revision to publication. At the end of the summer, all students will have their work published in one of two professionally produced anthologies—Rise, for elementary-aged writers, and Emerge, for middle- and high-school writers. 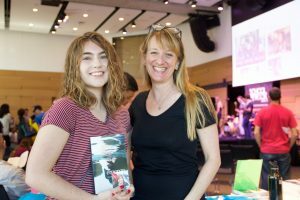 In September, Badgerdog hosts an end-of-summer reading, where selected campers from each camp location perform their work at the annual Austin Teen Book Festival. All summer camp writers are invited to attend, and the reading coincides with an anthology-release party and book-signing event that includes all campers. Can Any Young Writer Attend? Of course! Both eager and reluctant writers find Badgerdog’s workshops engaging and empowering. Our creative approach to the craft of writing allows hesitant writers to practice an essential skill in a no-fail, supportive environment—while also having fun! For more advanced writers, Badgerdog’s teaching artists provide challenges and offer personalized feedback. If your child has dyslexia, dysgraphia, ASD we can accommodate your child. We’ve heard from parents of other campers with these challenges that Badgerdog is an ideal place to practice writing and learn new skills. We ensure that campers feel encouraged to continue trying, experimenting, finding their voices. We welcome technology that makes writing easier and more accessible for campers. We want to avoid the use of smart phones or anything that may distract other campers, but otherwise such devices are encouraged. Our registration form will allow you to share information about your child with us so we can provide tailored support, or you can contact our Programs Coordinator to discuss questions or concerns before signing up. In and of itself, writing is a worthy pursuit, but at Badgerdog, we allow wr iters to take their work from the insides of a spiral notebook out into the world. That’s why each camp session culminates with a reading on-site, where students perform an original poem or story before an audience of fellow writers, parents, family, and friends. 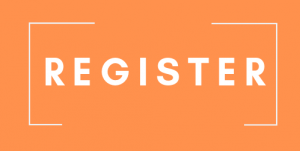 The registration fee includes a writing journal for each student, a Badgerdog T-shirt, one copy of Rise or Emerge, and a writing field trip or a visit from an author or a teaching artist in another discipline. Refund Policy: Full refunds, minus a $50 processing fee, will be granted for requests made more than 30 days prior to the start of the summer session. A partial refund of $200 per registration will be granted for requests made between 7 to 30 days prior to the start of the summer session. Refunds are not granted for requests made within 7 days of the start of the summer session. Early Bird Discount: A $15 discount will be applied to summer camp registration before March 1. Use discount code: badgerbird at checkout. Sibling & Friend Discounts: Parents registering more than one camper will receive a 5% discount per registration. This discount can not be used with other discounts and will be available after the early bird discount expires on March 1. Scholarships: A limited number of full and partial scholarships are available. To apply for a scholarship, please complete a scholarship form (via this link) by April 1, 2019. What do Parents and Campers Say About Summer Camp? 66% of campers say they like writing more as a result of Badgerdog. 71% of campers say they are better writers as a result of Badgerdog. When asked how campers felt when writing, 94% used a positive phrase, such as "energized," "alive like a bird," "like I have a workable outlet for all of my ideas," or "like a balloon of happiness has just gotten blown up inside me. What do campers like most about Badgerdog? different types of writing exercises to "get us out of our comfort zone"
the creative ways "we learned to write"
92% of parents say Badgerdog has a positive impact on their children's writing skills. 94% say Badgerdog has a positive effect on their children's attitudes toward writing. "Attending Badgerdog was the best activity C. participated in this summer. I was so impressed with the high quality of his instructor. The class was well-organized, with engaging, creative activities each day. And she created a safe space for C. to do something he finds pretty terrifying -- explore his own talent. It's a mark of how safe he felt that he actually participated in the end-of-camp reading with very little resistance." "Badgerdog drastically reduced writing reluctance, increased writing fluency, and increased interest in sharing writing with others." "The green light for self-expression." "Having a positive experience with a subject my child doesn't like." "It was great seeing and hearing my daughter describe each day of camp -- what she did in class, seeing her so enthusiastic about writing and speaking." "Exposure to different forms of writing. My older child was only interested in writing novels before attending camp, and this experience really opened her eyes to other forms." "Excitement about being published and having a 'real' author work with my daughter." "My daughter is dyslexic and has always been very negative about writing. However, she has had only positive things to say about her experience at camp." INTERESTED IN CAMP BUT CAN’T ATTEND THIS YEAR? TELL US WHY. Read students' poems and stories on our blog, Unbound.